Dual frequency gensets can either supply energy at 50Hz or 60Hz, offering an all-purpose solution for projects that use machinery at different frequencies. They are also advantageous as an important cost saving, as you can reduce the number of gensets required for your project. Genset adapted for emergency power and testing bench with two separate power supplies. 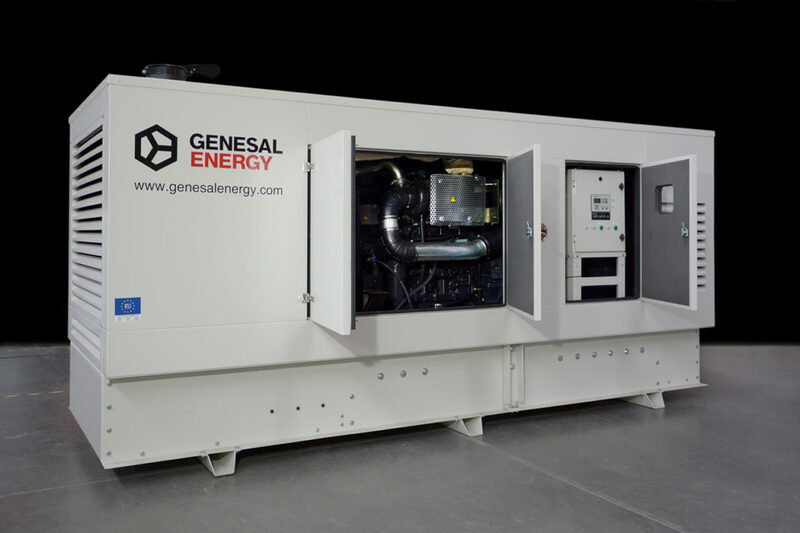 Genset to supply electrical energy in emergency situations in the factory of a leading Spanish cold storage facility manufacturer with projects mostly focused on Latin America. It works by monitoring two independent installations (400 A and 125 A). When either one of the installations fails, the genset starts up to supply energy. Also, the genset can be altered manually to work at 60 Hz to supply power to the machinery manufactured in Spain but sold in countries which use 60 Hz frequency. This allows pre-delivery quality control testing. The genset is covered by a 4.5 M long canopy permitting it to work outdoors and be protected from the elements. The final result is engineering that gives a newly innovative and individually designed solution to the needs of the client.